I find this16 symptom list very confusing. I have spotted a few paths and they are very different in damage power. This list seems to be trying to put all the spectrum in a thing which will make the one trying to use it very confused. I think what you are doing is great, I can see that you have probably dealt with a master psicopath as I have. Those are the ones that have unlimited damage power. Sociopath tend to discredit themselfs from time to time and they are a lot lazyer. Symtom Number 16 for example, if you are trying to spot a master psicopath and you read this it won’t help you, they are masters of planing , plotting scheduleing, and discipline is where they find and feel themself more god like. Their drug of choice I believe. A true zero empathy is unstoppable it’s not violent nor an addict its perfected the game since a child and will continue to play and win for ever. The only variations among them are were do they start how intelligent( not smart they are equally smart) they are and how much power they obtain. This article seems to have been written to put someone off of the scent of a psychopath, or by someone who is trying to discredit someone personally. For instance ‘no history of genuine suicide attempts’, er…I know a few people who don’t have any history of suicide attempts and most of those people seem to be on no spectrum. Or ‘Poor judgment and failure to learn from experience’, so the clever phsychopath has poor judgement. Who actually wrote this? Is it the person who produced this website or some ‘kind soul’ who sent in an article that was published without particularly looking into it. Or is the person who wrote this article a psychopath who has created a forum to allow them to change people’s minds? I’m so thankful to know I’m not going crazy and the turmoil he has created and the devastation is real but now I need legal help . the courts have bought into his maddnesd and I need help please I’m running out of time. I’m in tx. 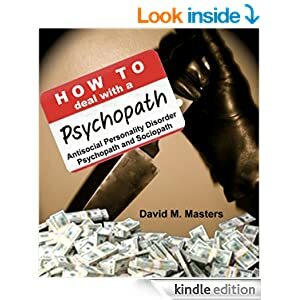 I have to mention and I want to ask if anyone else feels like a psychopath while dealing with one? I sonetimes feel like I am just like the psychopath and have teoubke talking myself out of it. I am working very hard to undo the behaviors I picked up from her but I can’t help but sit still and become socially isolated because I fear I am going to do the SAME thing to others and that I am not any better. Or is it just me and I am a psychopath too? Please reply if you can relate.